Electron Metal LAN racks solutions are perfect for situations where a standard cabinet or relay rack is not needed. LAN racks are offered in a wide range of sizes, and can be outfitted with an assortment of tabletops, shelves and pans to suit your needs. They feature an easy installation design, which doesn’t require any screws or special tools to remove and install accessories. An integrated vertical and horizontal cable management system is included with every LAN Rack frame, and keeps all wiring easily accessible but hidden within the frame. Long support legs mounted on adjustable rubber insulated leveling feet keep everything straight and level. Shelves are simply hooked into small slots along the front of the rack. Our LAN racks are an ideal solution for networking storage and workstations. The racks feature modular components and construction providing almost limitless adjustability and customization. With its open design, it allows easy access to both the front and rear of your equipment. Each rack features concealed cable management in its vertical members, as well as through the horizontal stiffeners, to keep your cabling in order. Shelves and other accessories can be adjusted in increments. All of our racks feature a simple “hook on”system for shelves and accessories. Your components simply hook onto the LAN frame, without the need for any special tools or hardware. Our LAN racks are also available in a double configuration. The rack includes long support legs on both sides for maximum stability. Mounting holes are equipped on the front and rear of the rack to allow shelves and other equipment to be installed on both sides simultaneously. Great for smaller areas that require more capacity with a smaller footprint. 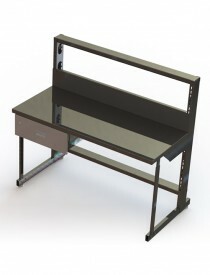 Our user-friendly workstation is ideal for repair, assembly and service technicians. With its large table surface, it offers a clean and uncluttered work area. A rear-mounted power bar allows for multiple electrical connections and large overhead fluorescent lights supply ample illumination. The heavy-duty frame is constructed of welded steel and has a reinforced base with a non-slip rubber surface footrest. The frame comes standard with a series of holes and cutouts to allow easy repositioning of accessories. Large shelves allow easy access to equipment and also provides for close-at-hand storage.